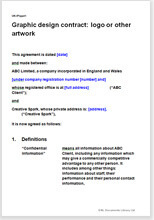 This is a straight forward contract for any graphic design work. It is written for the client to initiate and stay in control. This is. It is intended to make sure you, the client, get what you have paid for. It is intended to make sure you, the client, get what you have paid for. It provides for an assignment to you of all created work. It does not include a specification of work. That is assumed to be set out in detail in a schedule. The work you want could be to design and draw anything, from a logo to a whole website. We offer many agreements related to website design but no other covering exclusively graphic design. A very tough contract for a large project is at Website design and write agreement: client's version; with draft specification. This is easily adaptable to graphic design work.